Mobile phones work on the summit of the volcano, be careful, they pass only on the north zone and on the East of the summit, but not in South. At the end of the specialized backup plan (PS) of volcanic eruptions published in 1992, the volcanic vigilance corresponds to » a situation of abnormal geophysics activity « . This situation can end with the return to a normal level of activity (raised pre-alert), remain for a while (from one day to several weeks) or result in an eruptive crisis (raised alert). Alerte n° 1 : éruption imminente. Imminent eruption. 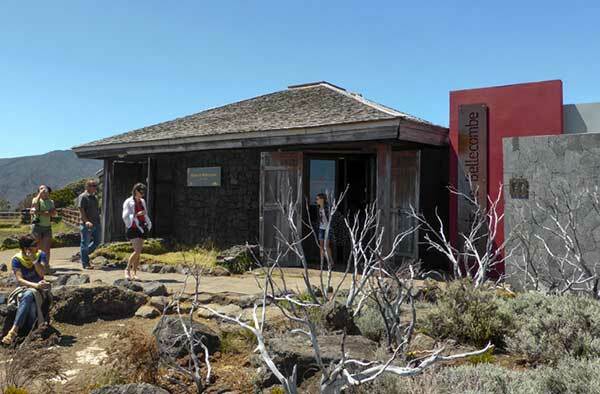 The monitoring centre (observatory) detects the signs of an intrusive crisis which in all probability will result in an exit (release) of lava. The access to the enclosure becomes forbidden. In the absence of exit of the lava, it is possible to return to the pre-alert phase. Alerte n° 2 : eruption in the enclosure. From “Le Tampon” or St Benoit there is only one road: the RN 3 which crosses the island. 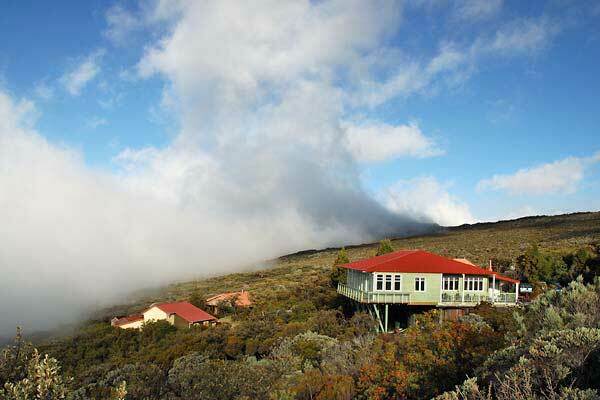 In “Bourg Murat” (where it sometimes freezes in winter) you turn at “La Maison du Volcan” (the house of the volcano) and begin a long ascent which will allow you to discover a vegetation of very green low mountain range (wet rain forest). You drive past the “Nez de Boeuf” (an attractive point of view ), then the ” Rivière des Ramparts”. 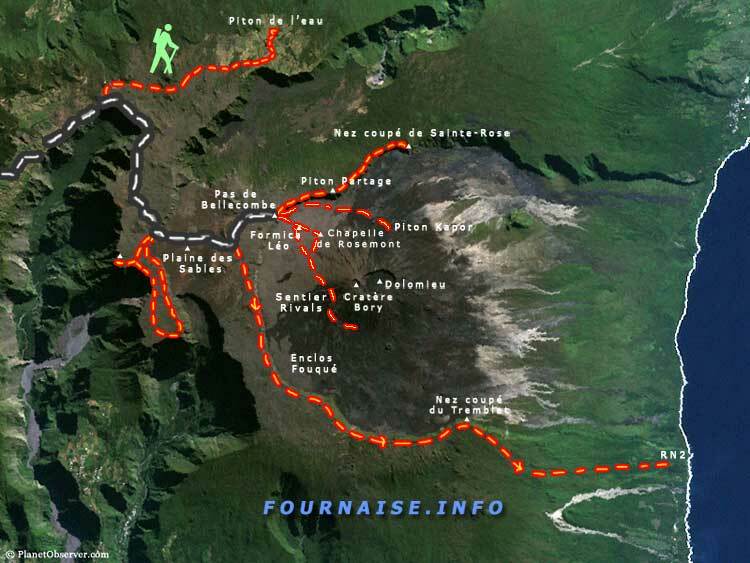 You will then arrive at the “Plaine des sables” possible stopping place) before reaching “Le Pas de Bellecombe”. (23 km from Bourg Murat). Plan light clothes if it is beautiful (a T-shirt and a pair of shorts) and warm clothes in case of rain (a sweat-shirt and a cagoule), it is always necessary to have them within reach because the weather can change all of a sudden. Do not forget to protect yourselves: if the weather is beautiful you can get sunburned (because of the reverberation on the lava), bring a cap and a solar cream. If the weather goes bad, you can hardly see a thing and walking becomes more risky for that reason, always plan « wide » schedules. Bring some water, food, and vitamins (chocolate bars, fruits), this hike is no picnic! Take comfortable and sturdy shoes (trainers or walking Shoes). Inaugurated in 2001, the relay offers warm and cold drinks to quench your thirst, sandwiches and even samosas!